The future of blending has arrived. 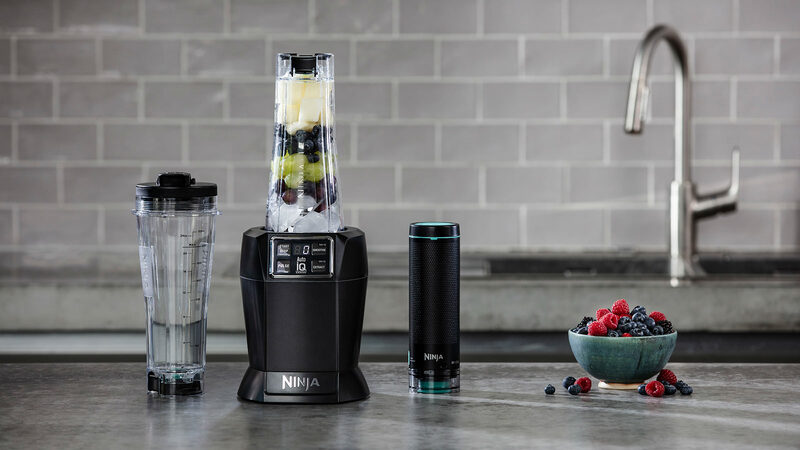 Now enhanced with brand new FreshVac Technology, this next-generation Nutri Ninja has all the much-loved features of our original single-serve blender. Experience the FreshVac difference. Vacuum blending removes oxygen, creating bright, smooth drinks with less foam and less separation than traditional blending. 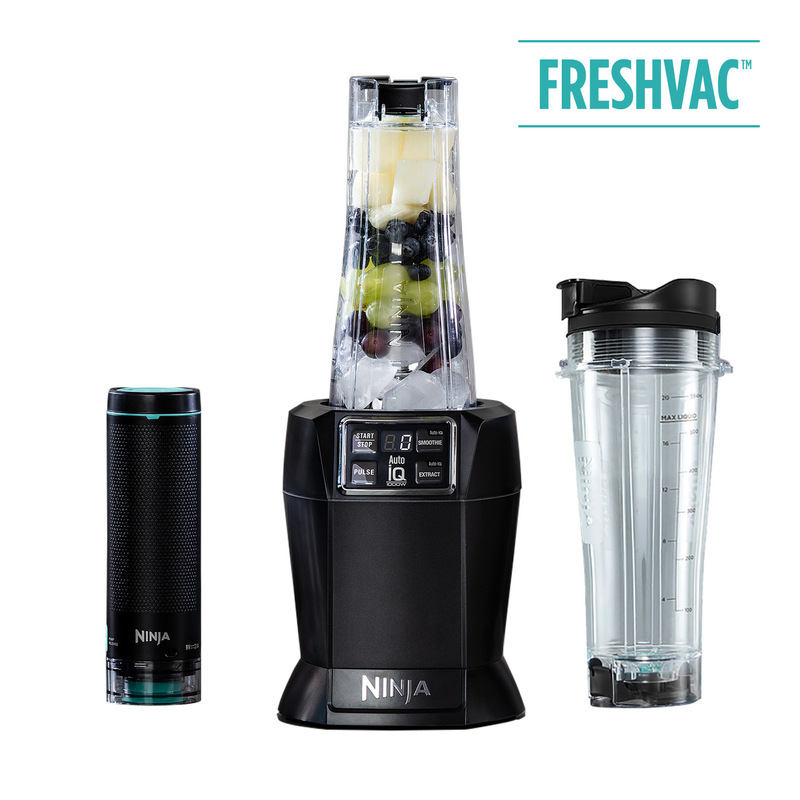 Nutri Ninja 1000W Personal Blender with FreshVac Technology BL580UKV has been added to your basket! Simply press one button and let Auto-iQ’s pre-set programmes do the work for you. Unique pulse, pause and blend patterns are tailored to deliver the results you want, with no guesswork. 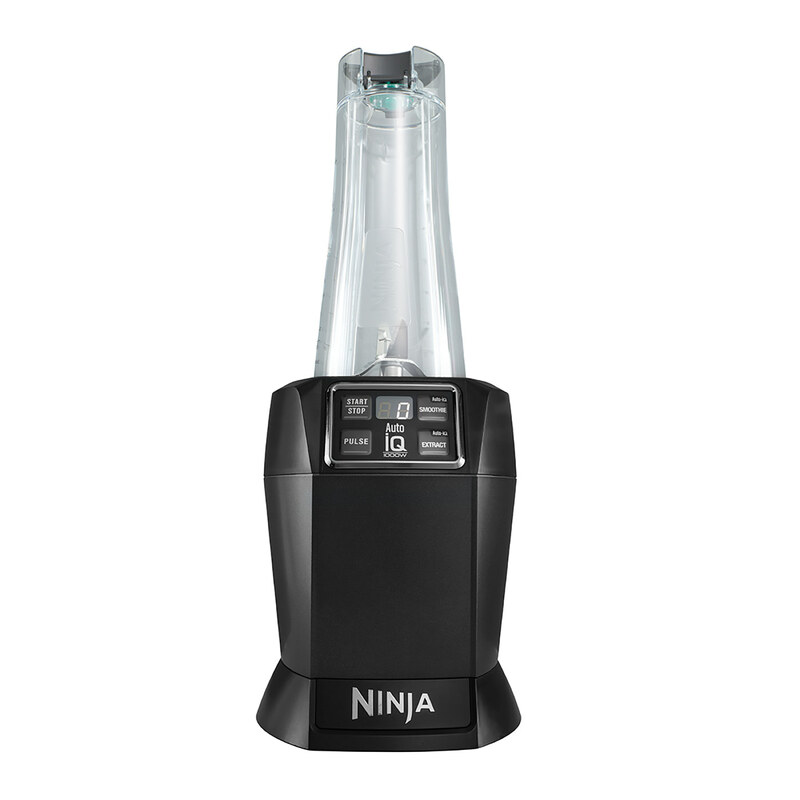 1000 watts of power drive Ninja’s patented Pro Extractor Blades to blend the toughest of ingredients, even ice, leaving you with deliciously smooth drinks exactly how you like them. Blend straight into your Nutri Ninja cup and take your healthy fruit smoothie, green juice or breakfast blend on-the-go with a Spoutl lid. Discover the future of blending. 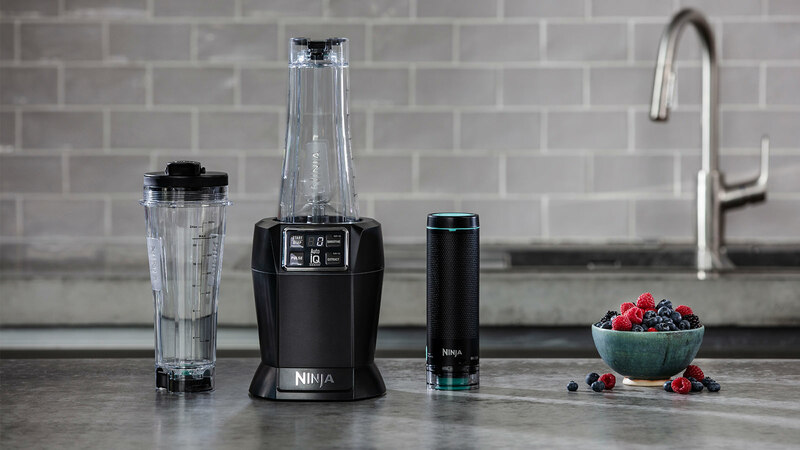 With all the much-loved features of our original Nutri Ninja, now you can also enjoy bright, smooth, vacuum blended drinks with innovative FreshVac Technology. Oxygen can cause the discolouration and separation of fruits and vegetables when blended. 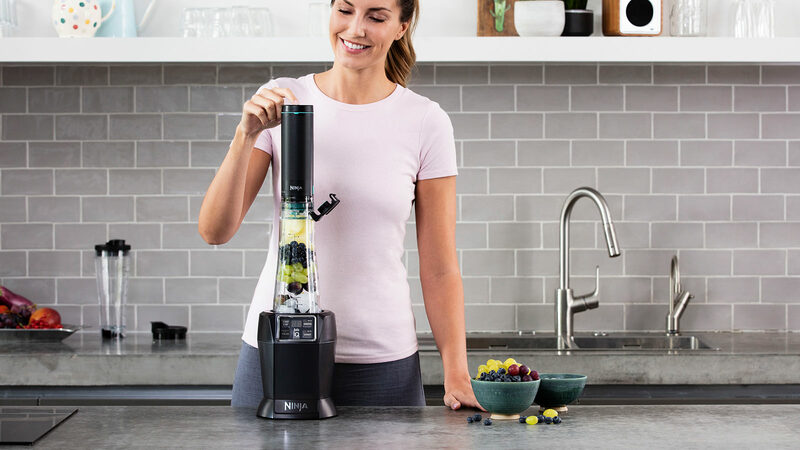 Vacuum blending draws out oxygen before you blend, locking in vitamins and creating a visibly brighter drink with a smooth texture, rich taste, less foam and less separation than traditional blending. How does vacuum blending work? Simply add your favourite ingredients to the Nutri Ninja cup then vacuum seal using the included FreshVac Pump before blending. Ninja’s exclusive Auto-iQ Technology promises smooth results every time, using unique pre-set blending patterns. 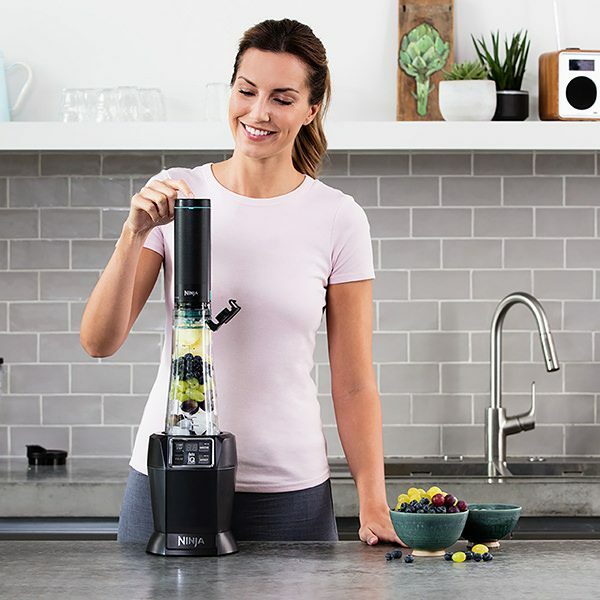 It’s never been easier to create great-tasting cool drinks and smoothies in seconds, bursting with all the vitamins and nutrients found in your favourite fruits and vegetables. 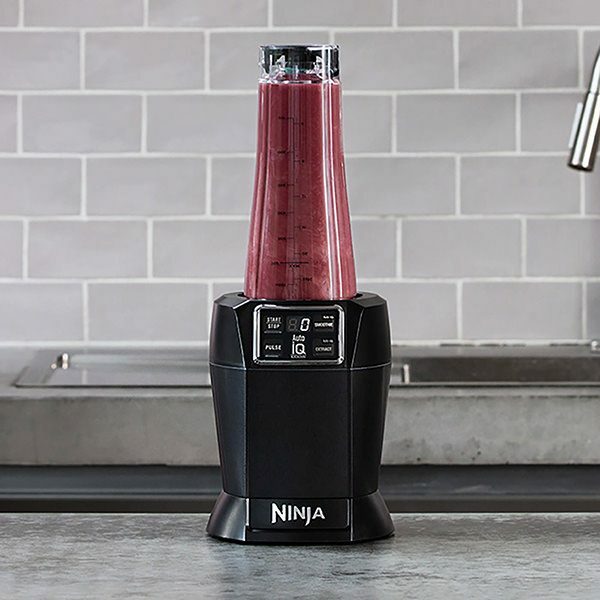 With 1000 watts of power driving Ninja’s patented Pro Extractor Blades, you can blend even the toughest ingredients, including nuts, seeds and ice. 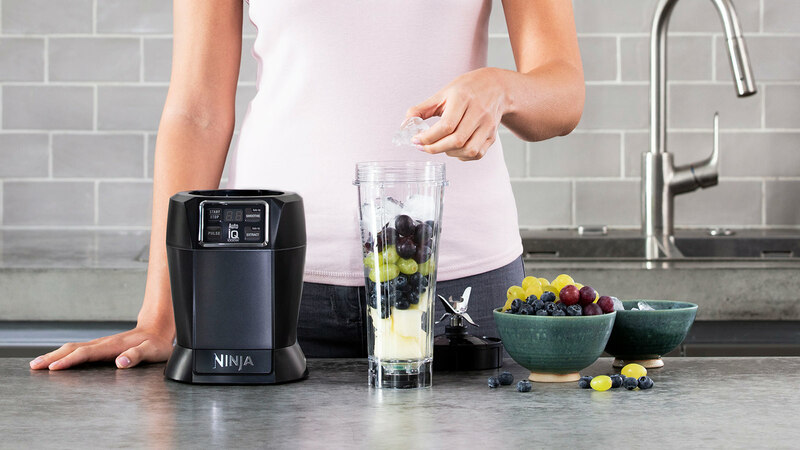 Perfect for making healthy fruit smoothies to take on-the-go, blend delicious drinks straight into a Nutri Ninja cup and add a Spout lid for travelling. Up to 23,000 rpm depending on program selected. What is the capacity of the single serve cup? The single serve cup can hold 700ml. Nutri Ninja 1000W Personal Blender with FreshVac Technology BL580UKV is rated 4.9 out of 5 by 62. Rated 5 out of 5 by Caz75 from Best blender Ever! I have used various blenders in the past but this one is superior to them all. The Vac feature makes it ideal for preparing the nught before. Makes smoothies smooth rather than thick and heavy. Rated 5 out of 5 by Sunshine1969 from Excellent This blender is excellent! Doesn’t take long for it to blend frozen fruit. Makes wonderful smoothies, very good value. I use it everyday! Easy to clean. Rated 5 out of 5 by Huffy from Blend it like Beckham I bought this last month as my old blender had seen better days and I cannot get over the sheer power of the product. As a health freak, I like to make my smoothies in the morning before I scuttle off to the gym. Each morning this machine decimated the fruit I added, meaning I had a fresh smoothie in my hand within seconds, I also had a few friends over last weekend and we were using it to crush ice and make cocktails. Such a Brucie bonus. If this product was a in the football world, it would be the David Beckham. Brilliant. Rated 5 out of 5 by VickiMPT from Perfect Smoothies every time! I have been using this blender for a couple of weeks and have been loving it for my morning smoothies. It works a lot faster than my previous blender and I love the actual smoothie setting on it so I can be getting on with other things whilst it is happening. I have also used it with some bliss ball baking and it mixes to a great consistency which isn't always easy with dates and protein powder. The fact it also looks great is another bonus, it is slightly noisy but it's a blender so I was expecting that :) Even though I was gifted it I would still highly recommend it for the price as it beats other blenders with the same price tag. Rated 5 out of 5 by Margie from Excellent blender I received my blender approximately a mont ago and have used it frequently to make smoothies, soup, sauces and hummous. Very simple to use the settings and blends everything so smoothly with no lumps which was imprtant to me having used other blenders in the past which have fallen short of my expectations. The blender is easy to clean, looks smart and not big and cumbersome to handle. I really like the holders/cups good size and have measurements which is very useful. Smoothies left over night in the fridge were fresh and held their colour as promised. Rated 5 out of 5 by Lisa F from Brilliant This is an amazing blender, creating the smoothest smoothies I've ever tasted. I've been particular impressed when making spinach smoothies - there are literally no bits, which has always been a peeve of mine with other smoothie makers/blenders. I like the different settings, so you can just let the blender do its thing for the optimal amount of time. I've also used it to make pasta sauces which has worked really well. It doesn't take too much space up in the kitchen, which is good, and the cups are a really good size AND have measurements on them which is really handy. The only snag is that it's very noisy, but that's only because it's so powerful and effective so I haven't knocked a star off for it! Rated 4 out of 5 by Rach84 from A great blender I absolutely love this blender, the only reason I’ve not given it 5 stars is that it’s very noisy. It works so much better than my old blender, and the drinks are definitely smoother. The product also looks great, sleek and stylish. All round a great product.